It's been way too long since I posted a new one in the separated by a past life series. It was worth the wait, however, because I think I conjured up the perfect one for this time of year. Has anyone else noticed that Jay Leno looks exactly like the Snowmeister from the stop motion holiday special "Year Without a Santa Claus"? Right down to the snowy hair and pointy chin, there's no mistaking the resemblance. Except I think "Snowy", as Mother Nature called him in the program, had more showbiz talent than our Uncle Jay (cue the sad trombone.) He could sing and dance! 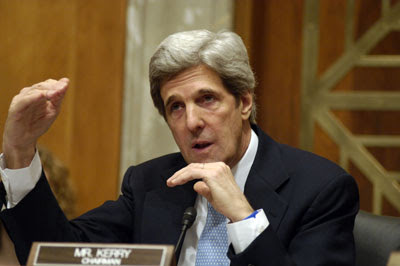 I also think Senator John Kerry looks likes "Mr. White Christmas" and here he's even making the same hand gestures. Next I just need to find a celeb who resembles the Heatmiser.